Note: Louise is writing all the reviews while Cathy is on sabbatical. She will return February, 2018. Security and privacy, where do we draw the line as we become more and more dependent on our digital devices? 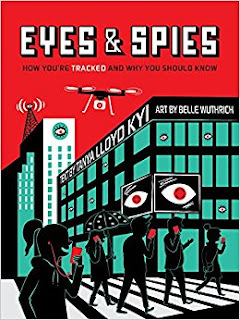 In Eyes & Spies, Canadian author, Kyi, looks at how companies, organizations, governments, and individuals collects and uses our personal information and data for a myriad of reasons, not always in our favor.. Topics explored: facial recognition technology, security cameras, data mining, cyberbullying, and tracking in schools. 1. Who’s watching, and why? 2. Where is the line between public and private? 3. How can you keep your secrets to yourself? The book has six chapters chock full of examples of how new technologies can be helpful, but also when used in certain ways can be an invasion of our privacy. From webcams, GPS, social media, to businesses tracking our movements using features on smartphones, this book balances the positive uses of new digital technology with the creepy side as well. “The Global Positioning System, or GPS, was developed by the American military in the 1970’s to help them calculate exact coordinates. They were carrying missiles on moving ships and needed to be sure they could aim precisely at targets.” In 2000, people and companies were given access to GPS, a real-life saver to many who find reading a map challenging. Kyi asks readers to weight in on whether they think it is crossing a line when parents use GPS tracking devises to keep tabs on their child’s whereabouts. Text boxes offer additional fact and real-life scenarios. The Creepy Line sections throughout the book asks readers to consider, if they ruled the world, where they might set up boundaries. The overall design is attractive. Colorful graphics and text boxes break up the text. Back matter includes further reading, sources, and index. I did question one comment regarding RFID tags. It's true that many retailers use RFID tags to track their products from factory to store, but Kyi states, “Libraries use (RFID) tags to track their books.” The public library where I work uses RFID tags in all materials we check out. They are used not to track where are book are at any given time. The tags work with our security system. If someone walks out the door with materials that have not been demagnetized our alarm system goes into action. Light flash! Alarms ring! Simply, RFID tags are used to stop individuals from stealing our materials. This is an interesting, relevant title; a good jumping off point for discussions.